Andinoacara biseriatus referred to as 'Aequidens' biseriatus [p. 218]. Andinoacara coeruleopunctatus referred to as 'Aequidens' coeruleopunctatus [p. 190]. Andinoacara latifrons referred to as 'Aequidens' latifrons [p. 188]. Andinoacara pulcher referred to as 'Aequidens' pulcher [p. 185]. Andinoacara rivulatus referred to as 'Aequidens' rivulatus. Andinoacara sapayensis referred to as 'Aequidens' sapayensis [p. 217]. Astronotus ocellatus referred to as Astronotus zebra [p. 92]. Bujurquina sp. 'bolivia' referred to as Bujurquina sp. 'Bolivien' [p. 198]. Cribroheros robertsoni referred to as "Cichlasoma" robertsoni [p. 487]. 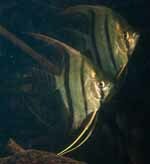 Herichthys pame referred to as 'Cichlasoma' cf. labridens [p. 340]. Heros liberifer referred to as Heros severus [p. 222]. Isthmoheros tuyrensis referred to as Vieja tuyrensis. Kihnichthys ufermanni referred to as Vieja sp. 'Rio Corzo' [p. 405]. Krobia xinguensis referred to as Krobia sp. "Xingu". 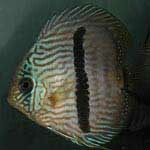 Mayaheros beani referred to as "Cichlasoma" beani [p. 351]. Nannacara aureocephalus referred to as Nannacara sp. "Mana" [p. 171]. Oscura heterospila referred to as Vieja heterospila [p. 389]. Parachromis multifasciatus referred to as Parachromis friedrichsthalii [p. 374]. Rheoheros coeruleus referred to as Theraps coeruleus [p. 415]. Thorichthys maculipinnis referred to as Thorichthys ellioti [p. 493]. 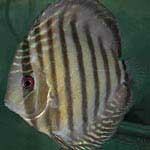 Thorichthys panchovillai referred to as Thorichthys sp. 'Coatzacoalcos' [p. 494]. 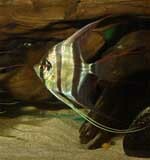 Tomocichla asfraci referred to as Tomocichla sp. 'Rio Guabo' [p. 435]. 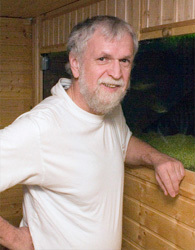 Trichromis salvini referred to as "Cichlasoma" salvini [p. 355].